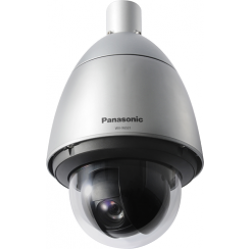 Panasonic offers Network Camera products according to users' needs. you can find the camera which you are interested from Panasonic Network Cameras in this page. WV-X6531NWeatherproof PTZ dome Network Camera40x Intelligent Zoom Stabilization iA PTZ CameraImage s..
WV-X6511N HD (1,280 x 720) / 60 fps "i-PRO EXTREME"
PANASONIC WV-X6511NWeather proof PTZ dome Network Camera40x Intelligent Zoom Stabilization iA PTZ Ca..
PANASONIC WV-S6530NWeatherproof PTZ dome Network CameraiA(intelligent Auto) H.265 PTZ CameraImage se..
WV-S6131Full-HD PTZ dome Network Camera40x iA(intelligent Auto) H.265 PTZ CameraImage sensor1/2.8 MO..
WV-S6130Full HD PTZ Dome Network CameraiA (intelligent Auto) H.265 PTZ CameraImage sensor1/2.9 MOSSu..
WV-S6111HD PTZ dome Network Camera40x iA(intelligent Auto) H.265 PTZ CameraImage sensor1/2.8 MOSSupp..
WV-V6430LIR LED PTZ Network Camera2 Megapixel 1080p Weatherproof PTZ Camera Equipped with IR LED*Onl..
WV-SUD638Anti-severe weather PTZ network cameraHigh durability under arctic -to- desert weather cond..
PANASONIC WV-SC588ASuper Dynamic Full HD PTZ Dome Network Camera12 V DC or PoE・High reliability and ..
PANASONIC WV-SW598ASuper Dynamic Weather Resistant Full HD PTZ Dome Network CameraFull HD / 1,920 x1..
PANASONIC WV-SW397BSuper Dynamic Weather Resistant HD PTZ Dome Network CameraHD / 1,280 x 720 H.264 ..
PANASONIC WV-SW395ASuper Dynamic Weather Resistant HD Dome Network Camera24 V AC or PoE Plus : NTSC,..